Volunteer your time, and help to clean-up and beautify our Long Island parks on May 6th! Volunteer your time, effort and skills on May 6th in celebration of I Love My Park Day! Photo by: Parks & Trails New York. The first Sunday in May is I Love My Park Day! I Love My Park Day is an annual event created by Parks & Trails New York (PTNY) in collaboration with the New York State Office of Parks, Recreation and Historic Preservation (OPRHP) that focuses on improving and honoring local parks and historic sites. 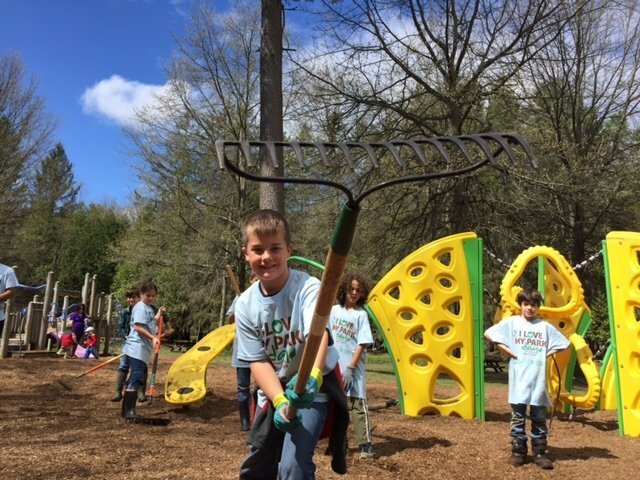 From beach clean-up, to beautification projects like repainting and power washing, to weeding and tree planting, there is much to be done to enhance New York parks and it’s all happening on May 6th. Take a look below at the various volunteer projects taking place at parks across Long Island for I Love My Park Day 2017! Project 1: Beach clean up or Trail maintenance. All ages welcome. Please bring a snack and weather appropriate clothing. Project 1: Cleanup, improvement, and beautification projects at the historic site. Projects include weeding, pruning, planting, bench staining, power-washing and general repairs. All ages welcome Please bring: Garden gloves and water. Project 1: Trail/cleanup. Registration/sign in from 9 AM - 10 AM. All ages welcome. Please bring water. Project 2: Painting. All ages welcome. Please bring water. Project 3: Picnic tables repair. 13 and up. Please bring hammer, screws. Project 1: Building wooden picnic tables.Appropriate for 13 and up. Please bring garden gloves. Project 2: Weeding, mulching, and renovating native butterfly and pollinator garden. All ages welcome. Please bring garden gloves. Project 3: Painting lifeguard beach stands. All ages welcome. Please wear painting-ready clothing. Project 1: Remove existing fence running from Field 2 parking lot to Golf Course entrance gate. Once removed, re-set old fence posts and replace removed fence with new fence. Appropriate for 13 and up. Please bring water and snack. Hats are recommended. Project 2: BBQ area improvements. Appropriate for 13 and up. Please bring water and snack. Hats are recommended. Project 3: Painting projects. All ages welcome. Please bring garden gloves, water, and snack. Hats are recommended. Project 4: Erosion control fence installation at various locations along Field 2 beachfront and dunes. Appropriate for ages 13+. Please bring water, snack and sun hat. Project 5: Litter removal from Field 2, 3, Democrat Pt. beachfront and dunes. All ages welcome! Please bring water, snack and sun hat. Project 6: Volleyball area improvements. This includes metal wire fence installation, landscaping, painting Appropriate for ages 13+. Please bring water, snack and sun hat. Project 1: Remove invasive plants from parking lot area and spread mulch. Adults 18 and over only.Please bring snack and water. Project 1: Cleanup. All ages welcome. Please bring garden gloves. Project 1: Beach Cleanup. All ages welcome. Project 2: Install Snow fence on beach, and install Mobi Mat walkway on beach. Appropriate for 13 and up. Project 1: Cleanup of NorthWest Pond's shoreline. All ages welcome. Project 1:Coastal Cleanup. All ages welcome. Please bring water. Project 2: Picnic Table Repair. Appropriate for 13 and up. Please bring garden gloves. Project 3: Plantings, Flower Bed Preparation. Project 1: Sailors Haven spruce up. Project 2: Pollinator Garden prep. Project 3: Wilderness Pick It Up! coastal clean-up. Project 4: Fire Island Lighthouse Beach and bay clean-up. Project 2: Butterfly garden clean-up. Appropriate for 13 and up. Please Bring: Garden Gloves and garden tools. Project 3: Carpentry work - door repair, porch repair. Adults 18 and over only. Please Bring: Carpentry tools. Project 4: River maintenance same start and end times, pruning tools. Project 1: Beach Clean up: Participates will collect garbage along the shoreline. Bring a hat, sun block, water, and garden gloves. All ages welcome. Project 2: Grassland Restoration Site: Participants will be raking vegetation debris, weeding or digging out woody vegetation OR clipping Bittersweet vines in near by woodland. Appropriate for 13 and up. Please bring garden gloves and loppers. Project 1: Prepping and planting flowers in boxes, planters and beds along the dockside and toll entrance. All ages welcome. Project 2: Prep and paint lifeguard stands. Appropriate for 13 and up. Please meet at park maintenance. Project 3: Shore and area litter picking. All ages welcome. Please meet at park maintenance. Project 1: Invasive removal, planting flowers and trees, and cleaning up streams. All ages welcome. Please bring garden gloves, water, snack, and appropriate outdoor clothing. Project 1: General Park Cleanup. Volunteers will be raking, litter picking and and mulching. All ages welcome. Please bring garden gloves, water, and a snack. Project 1: Painting/Trail work/Trail cleanup. All ages welcome. Project 1: Friendship Garden-rejuvenate friendship garden with new plantings and mulching. Appropriate for 13 and up. Please bring garden gloves, water, and bug spray. Project 1 - Beach cleanup - The volunteers will be completing a beach cleanup along Montauk Point and Camp Hero's Coastlines. We will also be pruning the 4 Wheel Drive Access Roads to the Beach at 10 AM. Project 2: Planting flowers and landscaping the buildings at 10:30 AM. Is Our Moral Compass Broken? This Week's Featured Adorable Adoptable is Nova! Where to go, What to do, And How to meet People! Subject: LongIsland.com - Your Name sent you Article details of "May 6th Is I Love My Park Day 2017: Where to Go to Clean-Up, Spruce-Up & Lend a Helping Hand"